Time: Normal hours Mon-Sat 10am - 5pm. Please note that the Preview Opening will start at 11am. Spring will be in the air soon, and what better way to celebrate this than to immerse ourselves in joyous and uplifting art. The Whitehouse Gallery will open the doors to an exhibition of works from twelve Fine Artists, with the spotlight shining on one artist in particular. The exhibition preview opening will be on Saturday 2nd March, doors will open from 11am and all are welcome to attend. Complementary drinks and chocolates will be on offer. A brand new feature for 2019, our ‘featured artist’ for the Spring is Jackie Henderson. Fans of Jackie’s work will be in for a treat, as she will be delivering a large number of paintings of all sizes for this exhibition. Glasgow based Jackie has been building her reputation over the years, and now has an extremely strong following. Her acrylic paintings, often featuring simplified scenes including birds and girls with stripey socks, focus on texture, form and colour. 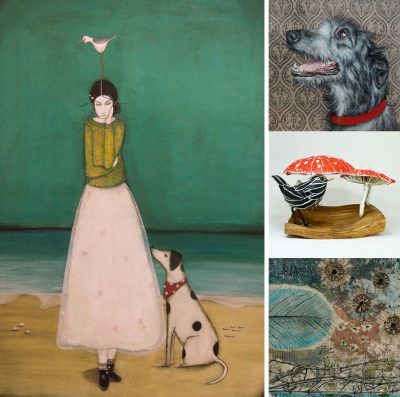 We are thrilled to introduce some new artists to the gallery for this Spring; Poppy Cyster, Malcolm Dobbins, Kate Durdy, Gillian Henshaw, Sunita Khedekar and Samantha McCubbin. Poppy Cyster is a predominantly abstract artist. Her love and understanding of colour is apparent throughout her work, taking inspiration from a wide range of subject matter from aerial perspectives of the Scottish landscape to happy memories and treasured experiences. Kate Durdy works in mixed media to create intricate and vibrant collages. She loves to upcycle items into her work, hand stitch and incorporate texture, all with a sprinkling of sparkle. Gillian Henshaw works predominantly in oils, acrylics and pastels, and focuses on French and Scottish landscapes and gardens, as well as still life flowers. For this exhibition we have a collection of her beautiful still life paintings. Sunita Khedekar paints a wide range of subjects including contemporary landscapes and abstract art paintings. Her favourite medium is acrylic on canvas and her paintings feature cheerful colours. Samantha McCubbin’s art practise is dependent on the integration of colour, texture, line and shape. We are looking forward to receiving a collection of her still life floral work for this exhibition. The gallery also welcomes the return of Stanley Bird, who will be delighting us with some paintings of ‘man’s best friend’ or as Stanley calls them, some of his ‘dug-shots’. Last but by no means least, we are looking forward to new work by Layla Rose. Rose often incorporates story telling into her paintings, with previous work having focused on children which have captured the hearts of so many of our customers. We also welcome new work for our upstairs space from Colin Blanchard, Elena Guillaumin, Kevin Fleming and Robert Ryan. No exhibition would be complete without new collections of sculpture and Applied Art & Craft, including glass from Gregg Anston Race; sculpture from Alison Bell; paper sculpture by Suzanne Breakwell; textiles by Jo Gallant; jewellery from Melissa James; driftwood figures by Lynn Muir and ceramics by Isabel Merrick, John Scott (Sourdust Pottery) and Shirley Vauvelle. The gallery is a member of the Own Art Scheme, where any original work of art between £100 – £2,500 can be spread over ten months INTEREST FREE.